Motion-Enabled Live Electronics (MELE) stands for a particular approach towards live electronic music aiming at increasing the degree of the performers’ embodiment in directing or shaping the sound processing. The MELE approach was developed based on first results from the EGM project and making use of the sofware develoed in the project. A first public workshop on MELE took place in the context of the impuls 2009 International Ensemble and Composers Academy for Contemporary Music held biannually at KUG. Six composers and six performers from Europe, North America and Japan participated in the one-week workshop held in the CUBE performance space at IEM. Six compositions prepared for – and further developed during – the workshop were presented in the CUBE in a concert entitled Enacted Electronics. 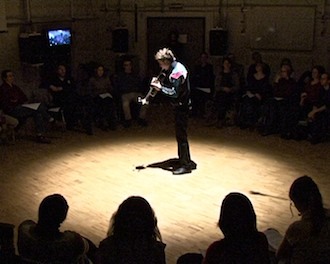 This concert took place on February 22nd 2009 and was transmitted via multi-channel Internet streaming to two remote locations in the context of the CO-ME-DI-A project, one of which in Graz (MKL at Kunsthaus) and the other one in Paris (IRCAM). In his trio Langs Rafels for clarinet, alto, and bassoon, Jesse Broekman explores hidden layers of instrumental timbre revealed by his sound treatment. The musicians navigate each others’ timbre spaces by moving about the stage, their spatial orientation shaping the sound spatialisation. In Langs Rafels, the clarinet, the bassoon and the right arm of the alto player are tracked. Video still of Annegret Mayer-Lindenberg (viola), Jason Alder (clarinet), and Dana Jessen (bassoon) playing Jesse Broekman’s piece Langs Rafels. Photo:Billy Roisz. 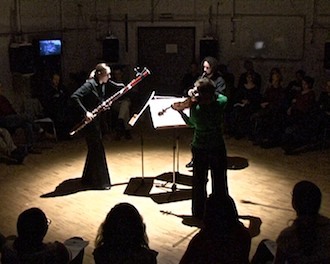 In Carlo Ciceri’s duo Violata for alto and flute, the spatialisation of the processed sound is related to the positions of the musicians on stage as they revolve around the centrally placed music stands. The movements of the musicians’ right arms induce subtle and organic micro-variations in the spatialisation keeping the projected sound alive. 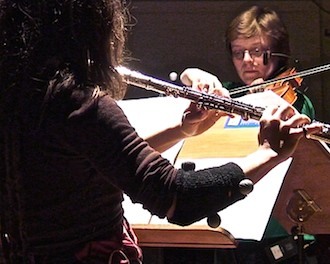 Video still of Annegret Mayer-Lindenberg (viola) and Marie-Noëlle Choquette (flute) playing Carlo Ciceri’s piece Violata. Video: Billy Roisz. 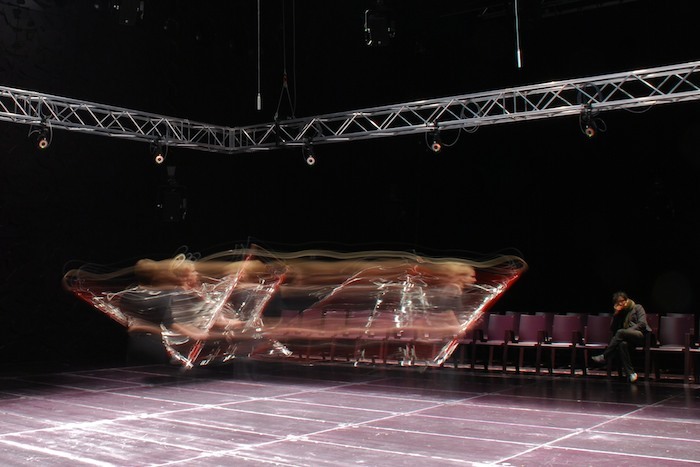 For his piece Tball for trumpet, David Pirro` created a vir- tual object with which the performer plays by participating in a real-time physical simulation. In listening to the sound resulting from the interaction and watching the behavior of the instrumentalist, the object appears in our imagination. In Tball, the trumpet’s bell is tracked. 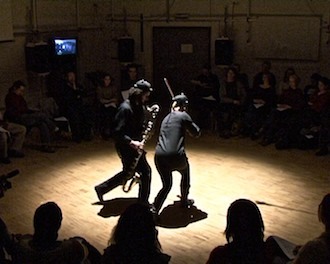 Video still of Paul Hübner playing David Pirrò’s piece Tball. Video: Billy Roisz. For his violin and bass clarinet improvisation duo A Short Walk Through Time, Stephan Prins built a granulation-based virtual instrument which is played collectively by the performers’ head positions and orientations. The composer is performing as well by controlling certain aspects of the instrument with a fader box. In A Short Walk Through Time, the two musicians wear tracked caps. Video still of Marieke Berendsen (violin) and Jason Alder (bass clarinet) playing Stefan Prins’ piece A Short Walk Through Time. Video: Billy Roisz. In Gerriet K. Sharma’s piece cornerghostaxis #1 the bassoonist is accompanied by a fixed four-channel electroa- coustic composition. The spatial behavior of the performer very subtly controls the spatialisation of the piece, thus al- lowing for an intimate relationship between the unprocessed instrument and the electronic sounds. In cornerghostaxis #1, a tracking target is attached to the bassoon. 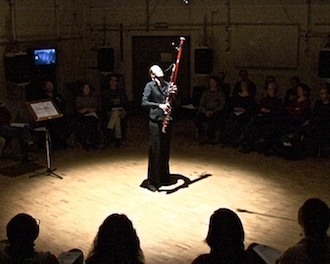 Video still of Dana Jessen (bassoon) playing Gerriet K. Sharma’s piece cornerghostaxis #1. Video: Billy Roisz. Tuning into paranoia by Shiori Usui is a piece for a trumpet and a bass clarinet player engaging in a dramatic situation on stage. The expression of their musically enacted state of mind is enhanced by the live electronics processing and its control through their socio-spatial relationship. In Tuning into paranoia the second bell of the trumpet and the head of the bass clarinet player are tracked. 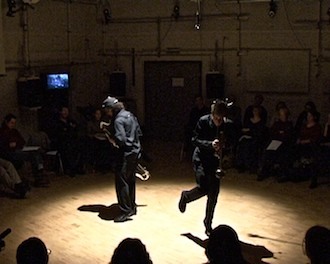 Video still of Jason Alder (bass clarinet) and Paul Hübner (trumpet) playing Shiori Usui’s piece Tuning into paranoia. Video: Billy Roisz.